Lady Frances Begonia Leatherman plants, which are commonly known as wax begonias, originate in the South American nation of Brazil. The scientific name for the plant is Begonia x semperflorens-cultorum. The plants are part of the Begoniaceae family. The attractive flowering plants have been a common fixture ingardens ever since the Victorian era. 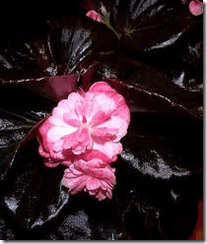 Wax begonias are herbaceous and tender perennials that are characterized by succulent stems. Wax begonias often create attractive mounds that range in height from 6 to 18 inches. The glossy foliage is oval shaped and appears in a wide variety of colors, including red, bronze, mahogany and green. Variegated leaf patterns also exist within wax begonia plants. The plants produce single or double flowers (which bloom repeatedly all through the season), and the colors can be anything from white and rose to pink and red. Wax begonias thrive when they are grown under partial shade or full sun (although full sun is optimal). Soil that is consistently moist and well drained is beneficial for successful cultivation of the plants. Garden soil that is rich in organic matter also works well. Regular watering is necessary for the plants. However, the plants are able to tolerate drought periods. It is important to fertilize the plants on a monthly basis. Wax begonias can be propagated easily via stem, seed and leaf cuttings. The plants should be spaced about 10 inches away from each other when planted outside, when there is no more risk of frost appearing for the season. 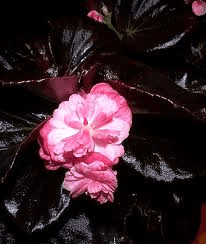 Wax begonias are, for the most part, free of pests; however, occasionally powdery mildew, stem rot, leaf spot and botrytis can occur when the plants are kept excessively moist. Wax begonias are often used as bedding plants. The plants commonly appear in low borders and beds, or by their lonesome in container gardens. Some of the dwarf varieties of the plants grow to merely 6 inches in height, and are ideal for edging purposes.